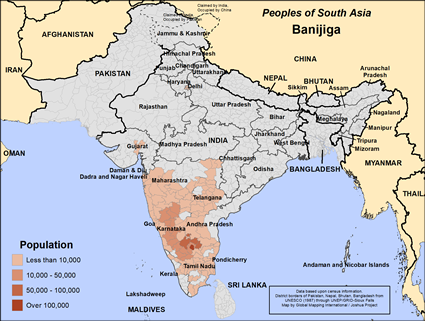 The Lingayat have a sub group called the Banajiga who live in Karnataka in India. They speak, read and write in Kannada and are vegetarians who eat wheat and rice as cereals. They have cousin marriages and have birth and marriage rituals. The dead are buried in a sitting position and they have yearly ancestor worship. They work in cultivation, trading and business. Hinduism is their religion. There are professionals among them such as teachers, doctors and engineers. Their children go to school. Modern medicines are used by them. They live in Belgaum and other regions of Karnataka. * Pray that gospel materials will bring the Lingayat to Jesus Christ. * Pray that Indian Christians will help lead them to Jesus Christ, too. Singh, K. S., ed. "India's Communities A-Z", Oxford University Press, USA 1999View Banijiga in all countries.